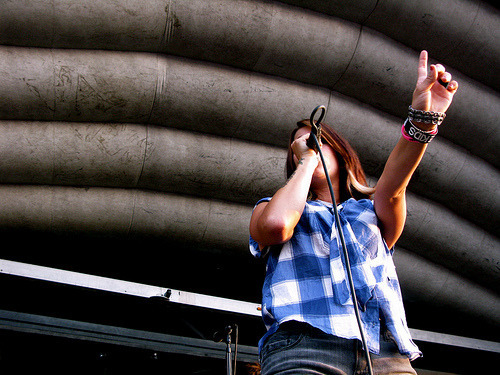 Cassadee Pope, singer of Hey Monday, is being sued for $50 million dollars by her old managers at Driven Entertainment group, who claim they are the reason for all of her success in the music business. The singer for the rock band Hey Monday was sued Friday by a Sunrise husband-and-wife team who claim they were forced out of representing the aspiring star after years of nurturing her talent. Cassadee Pope, 21, of West Palm Beach, had one of her songs covered on the popular Fox TV show “Glee” earlier this year, has recorded a few albums and toured with Fall Out Boy and other bands. Dominick and Tammy Centi say none of it would have been possible without their early investment in Pope’s singing, starting when she was 12. Dominick Centi claims he discovered Pope in 2002 and signed her with the Centis’ talent management company, Driven Entertainment Group. The couple filed a civil lawsuit against Pope; her mother, Lori Pope; Sony Music Entertainment Inc.; Columbia Records; and others, alleging breach of contract. The lawsuit, filed in Broward Circuit Court, seeks an unspecified amount of damages but the couple’s attorneys, Peter Ticktin and Jamie Sasson, said they plan to seek $50 million in punitive and other damages. They place most of the blame on the record company and other managers who got involved in representing Pope. Miami attorney Richard Wolfe, who represents Pope, said the lawsuit is just the latest twist in a lengthy effort by the Centis to get money from Pope. “They had very little, if not nothing, to do with her success,” Wolfe said, adding that Pope terminated their contract for cause. “They are looking to squeeze anybody they can for anything they can because they have been so unsuccessful at what they do,” Wolfe said. Dominick Centi said Friday that his ire is not directed toward Pope, who he thinks was manipulated into abandoning her mentors. “We weren’t looking to hurt her; we know she was used as a pawn,” Centi said. During more than six years of working with her, the lawsuit said, the couple made a demo tape with her, got her numerous bookings and a contract with Kodak Inc. which showcased one of her songs, as well as a performance at a major music conference. But the relationship came under duress in late 2007, according to the lawsuit, after one of Sony’s record labels became interested in signing Pope. “The artist was put in an impossible situation … as she understood that if she remained loyal to her managers, Driven and the Centis, the people who had led her to the brink of stardom, she would be throwing away her dream of signing a major recording contract, going on tour and recording an album,” the lawsuit alleges. Under the terms of their contracts with Pope and their anticipated long-term relationship with her, the Centis believe they are entitled to 20 percent of the revenue.